Arc House i Barcelona, Spania: Bestill nå! 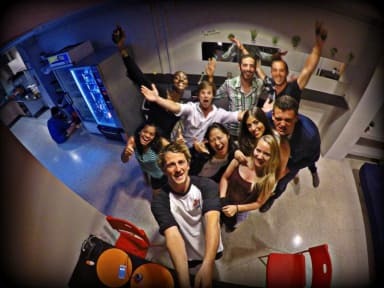 Arc House is a hostel for people who are looking for a comfy & budget friendly place to stay during their visit to Barcelona. Our central location, 10 minutes from edge of Barcelona’s Gothic Quarter, makes exploring the city on foot very easy. The Picasso Museum and beautiful Santa Maria del Mar Church are a 15-minute walk away. You can walk to the city’s beaches in 18 minutes or take a bus nearby. Plaza Catalunya (main city square) is 15 minutes away walking distance. We are 200 meters from the bus station Nord, 150 meters from the Arc de Triunfo and 100 meters from the beautiful Parc de la Ciutadella. Our rooms are spacious with free lockers. There is free WiFi in the entire hostel . We have large common areas including free of charge computers, and a T.V. with Netflix. Vending machine with drinks and snacks available. Two fully equipped kitchens also available. One broken toilet, everything was filthy, staff was not helpful upon arrival. The showers was terrible and had only cold water for long periods, they were also completely filthy. Rooms were full of sand all day every day.